The Susan L. Bennett Recovery Resource Room, located at the Mental Health Association, 1101 Peach Street, Erie, PA, was dedicated on Friday, May 19, 2006 at 1:00PM DST. Ms. Bennett, founder of the organization now known as the Mental Health Association of Northwestern PA guided the organization for five years. She personified principles and values which the organization holds dear today. Special invited guests, consumers and staff were present at the ribbon cutting ceremony. Mr. Bill Grove, current CEO of the MHA made opening remarks. Approximately 30 people entered the room. Several people offered their thoughts and feelings of gratitude. Ms. Bennett acknowledged those present. After group pictures, refreshments were served in the café. Conversation and fellowship completed the afternoon. The vision began to form in March 1992. Consumer Empowerment Project began at MECA in 1992 with a vision of consumer- run, consumer- directed projects initiated. The idea was to cultivate a group of people interested and involved with agency boards, in essence to have real consumer involvement on boards who were directing the flow of services being provided. A group of people took action. A group of people met in the basement of the Arts and Culture at Stairways. They talked of a need for more structure, help to have a consumer support group and a consumer drop-in center in Erie, PA. John Farmer visited, talked and offered support to this determined group. Meetings followed at the MECA Office in the Baldwin Building (now Renaissance Center). They learned how to structure a group, had training in group facilitation and visited drop in centers in PA.
Another individual wanted to start a local chapter of the Depression Manic Depression Association (now Depression Bipolar Support Alliance). He needed a place to hold the meetings. At the time DMDA met two different days at two different times. Mr. Bill Grove, then Director of Social Workers at Saint Vincent Hospital found space for DMDA to hold information sharing and support to those on the inpatient unit. Confidentiality was upheld. In 1993 Erie/Warren Projects happened for Erie County residents receiving treatment at Warren State Hospital, North Warren, PA. "Together We Stand" was a group of consumers who met at Stairways. They had an impact on the downsizing of Warren State Hospital. They received funding to start the Consumer Center. The Consumer Center operated in the basement of Mid City Towers during the 1992-1993 fiscal year. Consumer Projects started in 1994 with a "drop-in center" and the Consumer Satisfaction Team. The Consumer Satisfaction Team was added in the 1993-1994 fiscal year. Visits were made to consult with and receive training from Loretta Ferry, Consumer Satisfaction Team, in Philadelphia, PA.
Ms. Bennett worked with Mr. John Farmer from Southeast PA to turn the vision into reality for Erie, PA. Providers, Erie County MH officials, family members and consumers supported the idea. In 1994 the Consumer Center and the Consumer Satisfaction Team were incorporated as the Erie County Coalition of Mental Health Consumers (ECCMHC) with a Board of Directors and Susan L. Bennett as Executive Director. The ECCMHC operated in various locations over the next couple of years. In 1996-1997, ECCMHC operated out of Old Main (part of Stairways) on West 21st and Sassafras Streets. The tireless search continued for a permanent location for consumers to have support groups and a Consumer Center. In August 1997 the ECCMHC bought a building at 1101 Peach Street, Erie, PA. In December 1997 Ms. Bennett left the organization to continue her recovery journey. We honor Ms. Bennett for her vision in helping consumers pursue and fulfill their dreams for consumer led groups and a safe place to be. 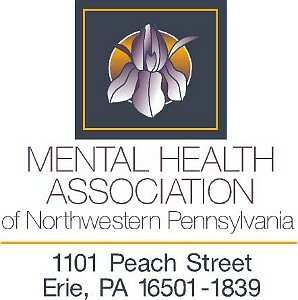 In 2000 the ECCMHC affiliated with the National Mental Health Association and was renamed the Mental Health Association of Northwestern PA. In 2005 external advocates began working at Warren State Hospital to ensure that patient's rights were being preserved. In 2006 a Community Advocate began working in Forest/Warren counties to ensure that families and children were receiving the treatment that they were seeking.